An overview of beginning your Japanese Woodblock print collection and a preview of the upcoming Jasper52 auction on Saturday, September 10 at 4:00pm ET. Written by Dieuwke Eijer. The word ‘collecting’ is often associated with ‘lots of money.’ As that may be correct in specific categories of collectables, some of the traditional collecting fields are offering us surprising opportunities. Luckily, within the Japanese woodblock prints we can find an amazing variety of high quality prints in good condition that do not break the bank, along with the blockbuster prints, such as the “Great Wave” by Hokusai. Each category produced remarkable artists and subjects, to satisfy each possible angle of collecting prints. You can collect broadly, picking one print by each artist or school, from the beginning of ukiyoe until today. 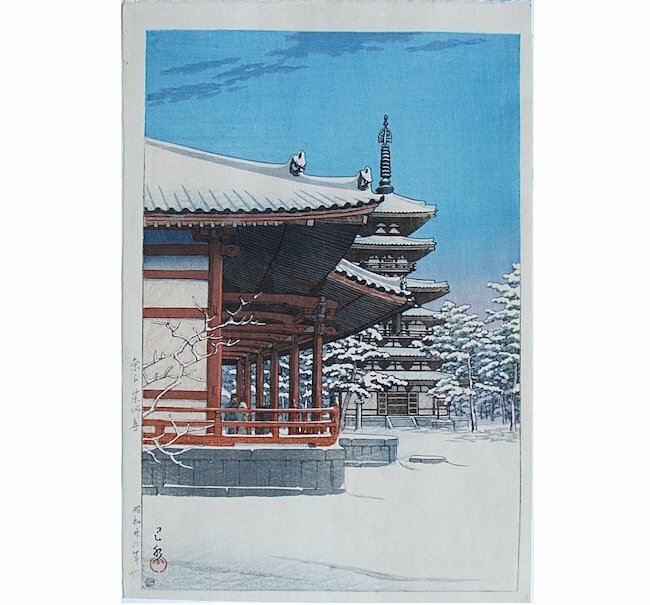 But there are also print collections narrowly focused on certain elements, such as on clocks, or firemen and their equipment, collections of works by Kawase Hasui and his peers (example below), or of complete series by a single ukiyoe artist – such as the B.W. Robinson collection of Kuniyoshi prints. The group of prints offered in the September 10th Jasper52 auction, represents a broad array of artists from the ukiyoe school to the sosaku-hanga movement. 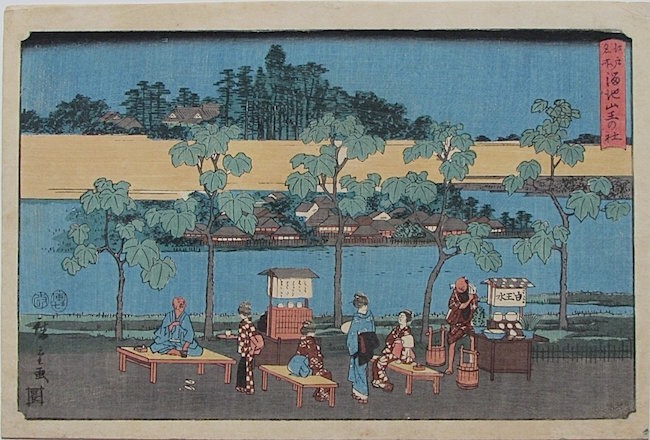 Among the ukiyoe school prints, you will find works by Hiroshige from a variety of his series. Each of them is a very good impression and in remarkable color condition, giving us insight in some aspects of life in the city of Edo or along the road. The inside of an inn in Ishibe, a samurai train crossing the Oi River near Shimada, or people enjoying tea, a pipe and something to nosh at a tea stall near the Sanno Shrine. 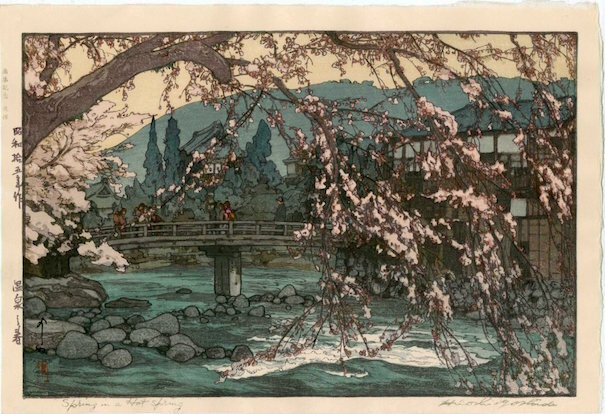 In the late 19th century, Westerners started to travel to Japan, and the prints from that period reflect modern art concepts that led to the shin-hanga movement in the 20th century. Simultaneously, some Japanese artists chose to stick to traditional Japanese themes and turned their focus to nature. Examples of both can be found in this catalog. Eight works by the great observer of birds Ohara Koson are complemented by bird prints by some of his contemporaries, representing the artist group that turned to nature. 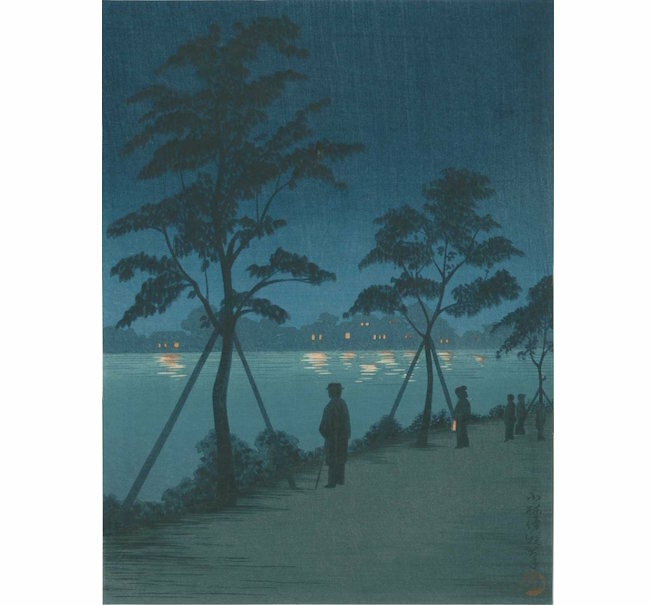 On the other hand, great atmospheric evening views along the Sumida River in Tokyo by Kobayashi Kiyochika show us western influences. A canal with houses lined up in perspective; the silhouette of a man in western suit and hat among people dressed in kimono. Shin-hanga artist Yoshida Hiroshi continued the landscape tradition of his great predecessors Hokusai and Hiroshige. At the occasion of the publication of his catalogue raisonné in 1987, a few of his masterworks were re-printed from the original blocks. Printed with the same care that Yoshida himself would have exercised, would he have lived, these posthumous works in amazing condition are affordable. The prints are closed off by a few representatives of the sosaku-hanga movement and contemporary artists. Their names may be lesser known among the western collectors, but the quality of materials and degree of perfection are continued and can make the starting point of a wonderful collection. Dieuwke Eijer has over 20 years experience in Japanese traditional art. Before relocating to NYC, she led the Asian Art department at one of Europe’s oldest auction houses. She currently works with international buyers, auction houses, and gallerists to develop their collections, and is a member of the Japanese Society of Arts (Netherlands), the Japanese Art Society of America, and the International Netsuke Society.